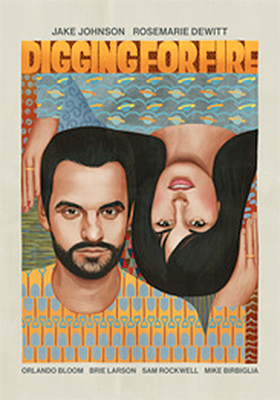 Paramount Home Media has added prolific indie filmmaker Joe Swanberg’s latest comedy — a love-affair for all-things Los Angeles — Digging for Fire to its Nov. 3 DVD release package. Already in place on that date are a trio of multi-disc, full-series collections — Californication: The Complete Series (a 14-disc set), I Love Lucy: The Complete Series (a whopping 33 discs) and a remastered presentation of Star Trek: The Complete Original Series (the Enterprise, Kirk and Spock boldly go on adventures spread over 25-discs). Tim (Jake Johnson — Jurassic World, as Nick in the New Girl sitcom series, plus such films as Neighbors, The Pretty One, Drinking Buddies, etc.) and Lee (Rosemarie DeWitt — Rachel Getting Married, Your Sister's Sister, Kill the Messenger) are a thirty-something L.A. married couple — with a kid — who are stressed to the max. So when the opportunity to house-sit away from their digs to the luxury of a secluded Hollywood Hills abode comes their way they jump at it. It would have been the perfect getaway, but the bickering starts and Tim has to get the family taxes done, so Lee packs up the kid and heads across town to hang with her parents (cameos by Judith Light and Sam Elliott). Before she heads out Tim discovers what appears to be a human bone and rusty revolver … and that discovery will eventually get the best of him. Digging for Fire is an “actor’s actor film,” meaning that Swanberg has his friends populate his films as ensemble players … he’s not quite there in his art, as say a Robert Altman or a Woody Allen, but that will come in time. 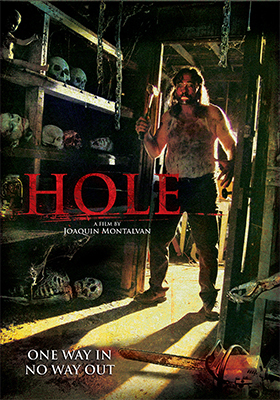 Digging for Fire is a major milestone along that path (especially as an indie film; The Orchard handled the film festival and arthouse runs, with Paramount picking it up for the home entertainment market place). His set-up here neatly diverges into two storylines. Lee gets a night off from her three-year old son, but that doesn’t go as planned as she instead spends the evening with a sensitive and well-meaning chef (played by Orlando Bloom). Meanwhile, Tim abandons the taxes in favor of a BBQ, beer bust and treasure hunt with a trio of his buddies — Phil (Mike Birbiglia), Ray (Sam Rockwell) and Paul (Steve Berg) — which soon finds more arrivals, including “Max” (Brie Larson — best know as Kate in the United States of Tara sitcom, plus such films as Short Term 12, 21 Jump Street, The Gambler, Trainwreck), winsome beauty that catches Tim’s eye. Will Tim and Lee survive their L.A. adventure? That’s the big question … and what of that rusty gun and the bone? With Universal Studios announcing a release date for Amy Schumer’s hit comedy Trainwreck (Nov. 10) this past week, it was only natural that Comedy Central and Paramount would be all over that with an Amy Schumer announcement of their own. Two weeks later, Nov. 24, look for Inside Amy Schumer: Season 3, a double-disc collection of ten episodes. Guest stars include the likes of Paul Giamatti, Patricia Arquette, Jeff Goldblum, Bill Hader (her Trainwreck co-star) and Jerry Seinfeld. Bonus features include a blopper reel, outtakes, an unaired sketch titled “Engagement Photographer” and four extended video sessions. Also added to Paramount’s release calendar this week are both DVD and Blu-ray editions of Zoo: The First Season. Slated for delivery on Dec. 1, this 13-episode sci-fi series is based on the James Patterson and Michael Ledwidge 2012 novel of the same name and follows the research of zoologist Jackson Oz (James Wolk — Mad Men, The Crazy Ones, etc.). He’s become convinced that animals are becoming more and more aggressive in their attacks upon humans … even organized in their efforts. Bonus goodies include a video session from the Comic-Con launch, a behind-the-scenes featurette and more. Mill Creek Entertainment announced this past week that three, count’em, that’s right three new Mega-Set Instant Libraries will be heading to retail as part of the company’s Oct. 20 slate of new product offerings. Each set contain 24 discs. You read that right 24! Each collection contains 50 feature films, with all three packed with bonus selections … so let’s get right to it. For a complete listing of all 50 films included in Danger, Death and Dames see page 08 in this week’s edition of the DVD & Blu-ray Release Report or visit Mill Creek Entertainment’s website (www.millcreekent.com). But we are not done yet!!! 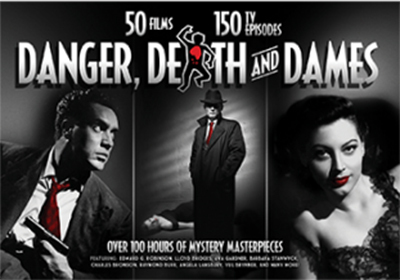 Danger, Death and Dames contains 150 crime-themed television episodes. For example, there are 25 Dragnet episodes, eight Racket Squad cases and 16 episodes from the husband and wife detective team series, Mr. and Mrs. North, with Richard Denning and Barbara Britton. 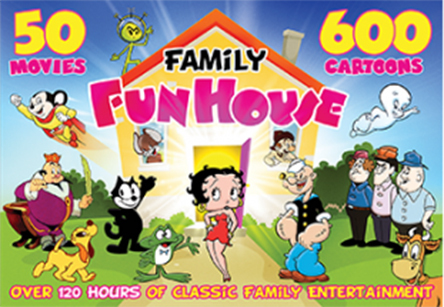 The next Mega-Set is titled Family Fun House and it features 46 feature films, four silent classics and, are you ready for this, 600 cartoons. WOW!!! 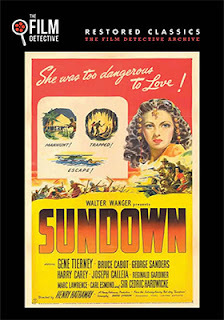 Among the film selections are The Admiral was a Lady (1950, directed by Albert S. Rogell and teams Edmond O'Brien with Wanda Hendrix), The Groom Wore Spurs (1951, Richard Whorf was the director and star power came in the form of Ginger Rogers, Jack Carson and Joan Davis) and Heading for Heaven (1947, written and directed by Lewis D. Collins and starring Stuart Erwin and Glenda Farrell) (see page 08 for a complete listing). Counted among the cartoon selections are 42 Betty Boop classics and 37 Popeye adventures. Genre fans can enjoy the likes of The Amazing Transparent Man, Menace from Outer Space, The Incredible Petrified World and They Came From Beyond Space. For a complete listing of all 50 film in the Robots, Rayguns and Rockets collection see page 08 or check these new listings (and more) at Mill Creek Entertainment’s web site (www.millcreekent.com). 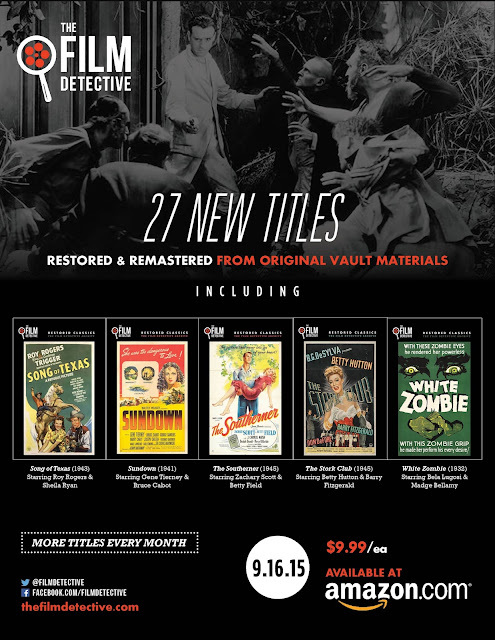 The Film Detective’s love affair with the cinema continues on Sept. 15 with 27 newly restored film treasures!! There is always something for everyone and this time around the selections range from Oscar contenders to those famous B-programmers. Classics all!!! 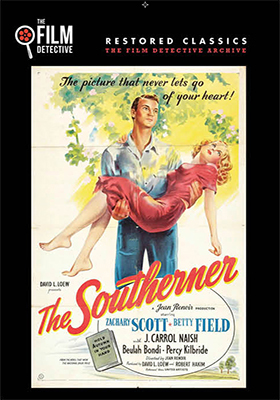 Kicking off the hit parade is one of auteur filmmaker Jean Renoir’s Hollywood-based productions (during his war years stay in the United States), The Southerner, starring Zachary Scott and Betty Field, with co-stars including Beulah Bondi and J. Carrol Naish. 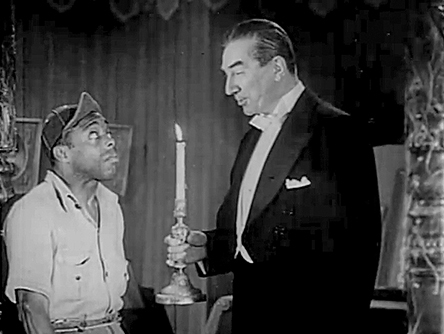 The film, based on the George Sessions Perry novel “Hold Autumn in Your Hand,” was nominated for Best Sound and Best Music, with Jean Renoir nominated for Best Director (despite a film career that included The Rules of the Game, Boudu Saved from Drowning and La Grande Illusion, this was his only Oscar nomination … he lost out to Billy Wilder for The Lost Weekend). Another Oscar-nominated film in the mix is director Henry Hathaway’s World War II thriller Sundown, starring Bruce Cabot and George Sanders in East Africa (Kenya — actually, New Mexico), with Gene Tierney as the mysterious Zia. The film was nominated for Best Cinematography (black and white), Best Art Direction and Miklós Rózsa’s music received an Oscar nomination for Best Music (it was his second of 14 Oscar nominations … he won for Spellbound, A Double Life and Ben-Hur). Another war film included in this Sept. 15 product mix from The Film Detective is director Frank McDonald’s 1943 spy thriller, Submarine Alert, which was filmed on the streets of Los Angeles and stars Richard Arlan and Wendy Barrie. 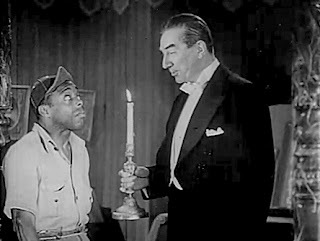 As to those marvelous B-movie (and there’s nothing “B” about them) treasures, we have screen legend Bela Lugosi starring in Scared to Death (his only color film) and White Zombie, plus teaming up with the East Side Kids in director Phil Rosen’s 1941 horror/comedy, Spooks Run Wild. And speaking of the East Side Kids — Leo Gorcey, Huntz Hall, Bobby Jordan and friends — their 1942 film, Smart Alecks (directed by Wallace Fox) will also be available as part of this mid-September release package. Westerns? You want Westerns? How about Range Defenders (1937, one of the Three Mesquiteers entries … Ray “Crash” Corrigan, Robert Livingston and Max Terhune star), Song of Texas (1943, directed by Joseph Kane and teaming Roy Rogers with Sheila Ryan) and The Star Packer (1934, John Wayne and his sidekick Yakima Canutt team to bring The Shadow to justice)? They are all here for fans to enjoy. The Stork Club was released at Christmas of 1945 and was a post-war box office smash. The direction is by Hal Walker with Betty Hutton in the starring role, Barry Fitzgerald and Don DeFore are her co-stars. For a complete listing of all the films included in this Sept. 15 release package, see page 06 of this week’s report or visit The Film Detective website (thefilmdetective.com). When dear old mom ties you to a chair and smacks the living hell out of you (and more) for days on end — as a child you quickly lose track of time — it does tend to color your thinking. Especially, if you snap and kill her. 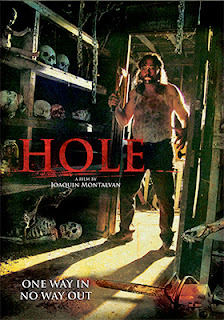 In director Joaquin Montalvan’s Hole, which is heading to DVD on Nov. 24 courtesy of Wild Eye Releasing, we pick up the horrible young life of Ed Kunkle (played by the late Paul E. Respass — Legend of the Hillbilly Butcher, Mobius; with Gavin Graham as the younger Ed) after spending some time in prison, who is now just scraping by as a janitor. He’s got this glazed, far-off look about him … he clearly needs help. When the voices kick in (and the flashbacks), you know it is just a matter of time before all that repressed rage is going to manifest itself. And boy does it. He kills mom again and again — young women, who are themselves tied to chairs and then bludgeoned to death. Trophies are kept (you don’t want to know). It appears that our boy Ed has only one friend in the world. That would be Eve (Teem Lucas — Mobius), his next-door neighbor, and those visits are both creepy (she too has issues) and tension-filled (is Ed going to snap?). The third member of this brutal horror tale is Detective James (Jim Barile), who is beyond being burned out. He’s seen way too much and has become numb to it all … the dark side calls him as well (if justice can’t be served, then he will dish out some of his own). Universal Studios Home Entertainment has tagged Nov. 10 as the consumer-ready street date for DVD and Blu-ray/DVD Combo Pack editions of director Judd Apatow’s Trainwreck, a star vehicle for stand-up star Amy Schumer. 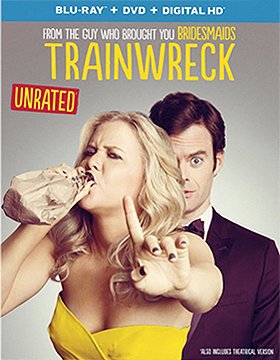 Expect to see Schumer in more films very soon as Trainwreck pulled in $107.2 million in domestic ticket sales and that translates to more screen appearances. Especially so, since she wrote the script and teaming with Apatow puts her on the inside track to more adult-oriented theatrical comedies as he is no dummy in smelling-out the nuts and bolts of those elements (writing and acting) that yield hit film properties. It doesn’t hurt that Apatow and Kim Caramele are among the producers and that her co-star, Bill Hader is an Apatow regular. Now Bill Hader you know from Saturday Night Live and such films as Knocked Up, Superbad and Tropic Thunder, but who is Kim Caramele you might ask. That would be Amy’s younger sister and tour manager! For the record, the ARR works out to an industry average of 116 days. Universal has both DVD and Blu-ray/DVD Combo Pack editions planned, with both SKUs featuring the theatrical cut of the film (R-Rated) and an unrated version (clocking in at an extra four minutes … likely featuring footage that might have pushed the film into NC-17 territory). 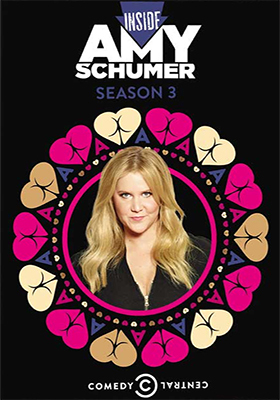 In addition to the two viewing choices, both home entertainment editions feature commentary from director Judd Apatow, writer and star of the film, Amy Schumer and associated producer Kim Caramele, a gag reel, deleted scenes and the “Line-O-Rama” feature. 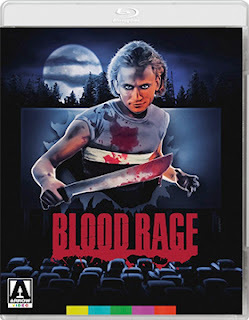 Arrow Video, with sales and distribution support from MVD Entertainment Group, has dusted off director John Grissmer’s 1987 slasher flick, Blood Rage (aka: Nightmare at Shadow Woods) and given it a brand new 2K restoration that features three different cuts of the film. A Blu-ray/DVD Combo Pack will be retail-ready on Oct. 20. It’s tough being a twin, vying for attention from mom. 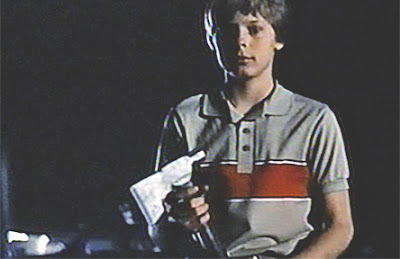 Terry (Mark Soper – Graveyard Shift II, Swordfish, White Oleander) is just a kid but it has already become an obsession, he wants it all and one evening, at the local drive-in theatre, he arrives at the perfect solution and hacks a teen to death with an axe. His brother, Todd (also played by Soper), is blamed for the crime and shipped off to an asylum. Problem solved. For ten glorious years Terry has had his mom (played by Louise Lasser) all to himself. And then news arrives that Todd has escaped. If you are as crazy as Terry is — especially knowing that his brother has suffered for ten long years as a result of his deception — the simple solution is to hack to death more people! Let the blood flow!! As mentioned, Blood Rage arrives with three viewing options. The first is the “hard” cut of the film, next is the “R-rated” theatrical release of Nightmare at Shadow Woods and the third is a “composite cut,” which combines elements of both versions. Other bonus goodies include commentary from filmmaker John Grissmer, video sessions with Mark Soper and Louise Lasser, the featurette titled “Return to Shadow Woods” and more. Sony Pictures Home Entertainment says that it is game-on come Oct. 27 with the three-SKU onslaught of director Chris Columbus’ Pixels. 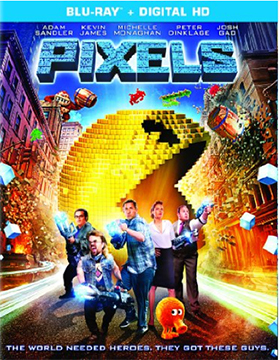 This Adam Sandler/Kevin James homage comedy to early-‘80s video games pulled in $73.3 million during its summer theatrical run and arrives in the home entertainment market place with an ARR of just 95 days. 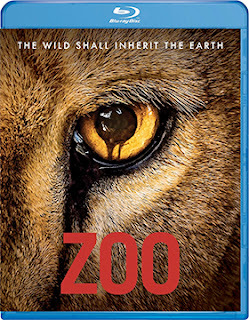 As to consumer choices, there will be a stand-alone DVD edition, a Blu-ray/DVD Combo Pack and a second Blu-ray/DVD Combo Pack featuring a 3D viewing option (the premium is seven bucks in the SRP for the extra Blu-ray disc in the 3D SKU). Icarus Films will handled the sales and marketing of the KimStim Collection’s DVD release of documentary filmmaker Jeremiah Zagar’s Captivated: The Trials of Pamela Smart. The street date is Nov. 10. Back in 1991, Pamela Smart was convicted of being an accomplice to the first-degree murder of her husband after a sensational trial that lasted two weeks. It was broadcast live, became a media circus and inspired two films — Murder in New Hampshire: The Pamela Wojas Smart Story, starring Helen Hunt as Smart and To Die For, with Nicole Kidman, Matt Dillon and Joaquin Phoenix as fictionalized versions of wife, husband and killer (both have been released on DVD). She is currently servicing a life sentence without the possibility of parole at the New Hampshire State Prison for Women in Goffstown, New Hampshire (where filmmaker Jeremiah Zagar was given access to interview her). As the murder plot unraveled, it was discovered that Smart had seduced a teen (William "Billy" Flynn) into murdering her husband (Flynn and his three high school buddies were also given life sentences, but all are now out on parole). Anchor Bay Entertainment announced this past week that director Antoine Fuqua’s Southpaw will be ringside on Oct. 27 with both Blu-ray/DVD Combo Pack and DVD product offerings. This Weinstein Company production arrives with a fast-to-market ARR of 95 days and domestic box office receipts for this Rocky-like boxing tale — starring Jake Gyllenhaal — currently stands at $51 million. 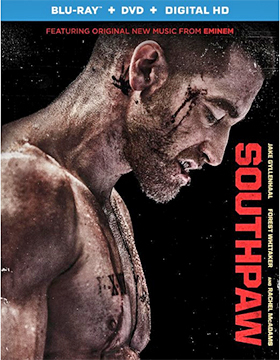 Bonus goodies for both SKUs include the featurette titled “Southpaw: Inside the Ring,” while exclusive to the Blu-ray edition are deleted scenes, the featurette titled “Extended Training Montage” and a Q&A video session with cast members.